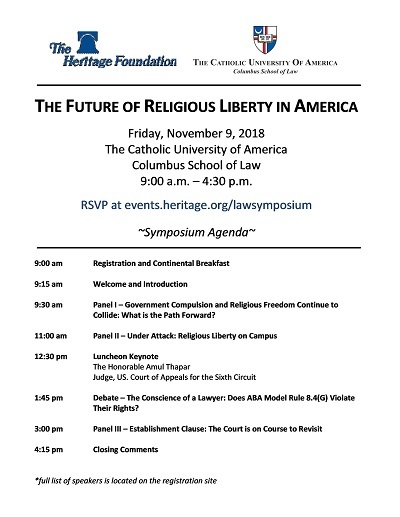 On November 9, 2018, the Columbus School of Law's Center for Religious Liberty and The Heritage Foundation hosted a symposium entitled “The Future of Religious Liberty in America.” The symposium consisted of balanced discussions, representing various viewpoints regarding religious liberty. Rienzi, Mark L., "The Future of Religious Liberty in America" (2018). Other Lectures & Events. 16.